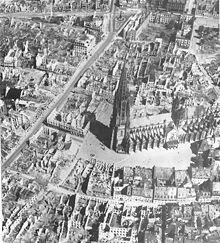 Modern Freiburg: the city was razed to the ground by the Lancaster bombers in World War II by the Royal Air Force (RAF). This is the Historischen Kaufhaus near the cathedral (which survived the bombardment). Lest We Forget: One of the heaviest air attacks on Freiburg im Breisgau was carried out by the Britain’s Royal Air Force (RAF) with the military code-Operation Tigerfish on the evening of November 27, 1944. Around 2800 people died. The British Air Vice-Marshal Robert Saundby was fond of angling and used the term ‘tigerfish’ for carpet bombings of German cities. Modern Freiburg has become an open city with lots of migrants and international students. Freiburg’s Old Synagogue was destroyed by antisemitists (nazis) during the Third Reich. The Freiburger city-fathers want to fill the place, where the olde Synagogue was, with life, even though it might sound cynical to some. The memories of the Shoa (Holocaust) is still painful. But we have to keep the flame of remembrance alive for this and future generations. We have to remember, lest we forget. We have to remind the people in Freiburg why this fountain exists where children love to play with the water of the fountain. Should this fountain opposite the university library be a solemn memorial like Auschwitz? People of all shades come and enjoy the lovely evenings in the university area and the Stadt theatre. It is filled with life when young people sing songs or dance nearby or when children gleefully laugh and run about. It is a sign of the liveliness of humanity. Freiburg also remembers the its partner city Matsuyama, which had to suffer due to the rain and the landslides that took their share three of human lives and 25 were killed in the vicinity of the Japanese town. Martin Horn, the new Oberbürgermeister of Freiburg, wrote in a letter to his colleague Katsuhito Noshi of Matsuyama in the name of the city-council and the citizens of Freiburg, expressing his condolence and sharing the pain. The city council stood up for a minute to think about the people of Matsuyama. The city-council of Freiburg will deciding about setting up a Documentation Centre. The Freiburger think and remember the revolutionaries Maximilian Dortu, Friedrich Neff and Gebhard Kromer, who were hanged during the Badischen Revolution by the Prussian military. The ‘Initiative to Remember the Badische Revolution’ will stage the scenes of the revolution with Wigand Alpers, Peter Haug-Lamersorf and Burghard Wein playing the roles of the revolutionaries. Tilman Moser, a Freiburger octogenarian, still remembers the effects of the war, Nazi-times and dictators have on the souls of people who have undergone these agonies, as well as the puzzled, pent-up feelings that emerge to the surface in the form of aggression or depression. In his ‘Clinical Noticebook’ published in 2014 he reports about experiences that have influenced his way of working, especially in the case histories that bear the title ‘Grandmother, Mother and Daughter’ (2015). In his book ‘Small Political Texts’ he deals with how terror, aggression and fanatical murders. He also throws light on emotional blockades that can only be solved at the physical level, and needs non-verbal pathways to reach the field of conflict within a person. When you stroll in Freiburg’s cobbled streets you invariably come across brass cobbled stones which are called ‘Stolpersteine’ (stumbling stones) in German. The story behind these stones is the fate of the victims of the NS-times in Freiburg. Like in all other cities of Germany there were a lot of Nazis in this nest. The initiative Stolpersteine in Freiburg works together with schools and youth groups and arranges lectures with the Volkshochschule, political parties, associations, religious communities and trade unions. It also carries out it work in the media and promotes publications. The stolperstein-initiative also organises Zeitgeugen (witnesses of time), holds exhibitions and memorials of the stumbling-stones. Some of the publications of the Freiburger Stolpersteine are: ‘Den Opfern ihre Namen zurückgeben’ ( Give the victims their names back) a book by Marlies Meckel, Rombach Verlag, Freiburg,2006. The other one is ‘Sainte Radegonde’ about family Abraham von Peter Künzel, Hertung Gorre Verlag, Konstanz, 2008. As an example we have Renee Weinheim, who was born on the 6th of May 1936 in Leipzig. She lived with her adoptive parents in Freiburg in the Tal Street 34. In the year 1938 he father died after he was forced to become an ‘aryan’ and had to give up his textile business. In 1939 her mother Johanna Weinheim and daughter Renee wanted to flee to Chile and later to Switzerland but in both cases it failed. In 1940-42 thousands of people were being deported but Johanna Weinheim managed to remain in Freiburg. However, Renee Weinheim and her mother Johanna Weinheim and her daughter Renee were arrested on 29.9.1942. Both were deported to Darmstadt and further to the concentration camp Treblinka, where they were murdered shortly after their arrival on the 1st of October 1942. Renee Weinheim was 6 years old. Her mother Johanna Weinheim 46 years old. FREIBURG, this lovely Schwarzwald town, remembers the freedom from Auschwitz on the 27th of January every year with a ceremony at the Historical Kaufhaus located near the cathedral. This year’s guest speaker was the Berliner historian Wolfgang Benz, who spoke about ‘Auschwitz Today: Perspectives of Remembering’ and how 71 years after the Nazi concentration camp Auschwitz (Poland) was freed by the US and Allied Forces on January 27,1945. Even though the Jews were gassed with Zykon B in the many concentration camps—the roots remained intact. And from these roots the Jewish community began to grow thanks to democracy and freedom of speech, movement and religion, which have to be treasured and protected by the Federal State. Freiburg’s former Dieter Salomon (Green) said: ‘Jewish life is enriching for the city.’ Representatives of the church were of the opinion that Jews and Christians have to feel like siblings. Religion can enrich the urban-society and avoid barriers. The historian Heinrich Schwendemann spoke about the Jews from the Middle Ages till today. A lot of documents pertaining to the Jews were collected and destroyed by the Nazis—and the roots almost eliminated. Irina Katz, the chairman of the Jewish community expressed her joy for the support from the city fathers of Freiburg in times of growing anti-semitism. Auschwitz lies in Poland today, but it was Hitler’s attack on Poland on September 1, 1939 that unleashed World War II. This war lasted five years and a half years, and devastated much of Europe. 55 million people died. The German armies defeated Poland, Denmark, Norway, Holland, Belgium, France, Yugoslavia and Greece. They advanced to Stalingrad and just sort of Moscow. They threatened even the Suez Canal. And the worst part of the war was the nazi regime’s commencement in 1942 of the ‘Final Solution of the Jewish Question.’ The Jews were arrested and sent to concentration camps in occupied Poland and murdered—without exception. In the past these very Jews were honourable citizens of Germany and Austria. They were systematically stripped of all human and civil rights. Thousands were maltreated and deported to concentration camps. Almost all the synagogues and countless Jewish houses and shops were plundered and destroyed and valuables confiscated. The Jewish refugees fled persecution by fleeing abroad. And today we have refugees from Muslim countries who flee to Germany because Chancellor Merkel has shown that she has learned her lesson from Germany’s history. She has shown civil courage of a special sort and has spoken out for those in need, despite growing protests from pegida, AfD, rightists, and even her own CDU and the sister party CSU (Bavaria). She’s not a fanatic but a lady who upholds the torch of freedom and democracy.